Bob's Training Blog: Ome Marathon Cancelled! Well, that was a bummer. Today's Ome Marathon (actually 30K and 10K - in Japan, everything is a "marathon") was cancelled (on Saturday) due to heavy snow on Friday. We got even more snow than we had a week ago - the two heaviest snowfalls in Tokyo in 40-50 years…in one week! It rained some on Friday night, which didn't melt much snow, just made it heavier and harder to remove. Out in the hills of Ome, the western edge of Tokyo, they probably had even more snow, and no way to remove it all from 15km of road, certainly not so that 15,000 people could run there safely. And the snow was "heavy": some fell off the roof of my house and put a dent in the hood of my car — a big dent! So instead of resting and carbo loading on Saturday, I shoveled snow and carbo loaded, adding wine along with the spaghetti. Had run Monday, Tuesday, Wednesday and Thursday, and was feeling pretty good. Oh well, will put my efforts into the club 5,000m time trial on the 26th. Did 5k + 5k on the treadmill in the gym today - park and bicycle path still too icy/slushy for running. Boy, do I hate treadmills. 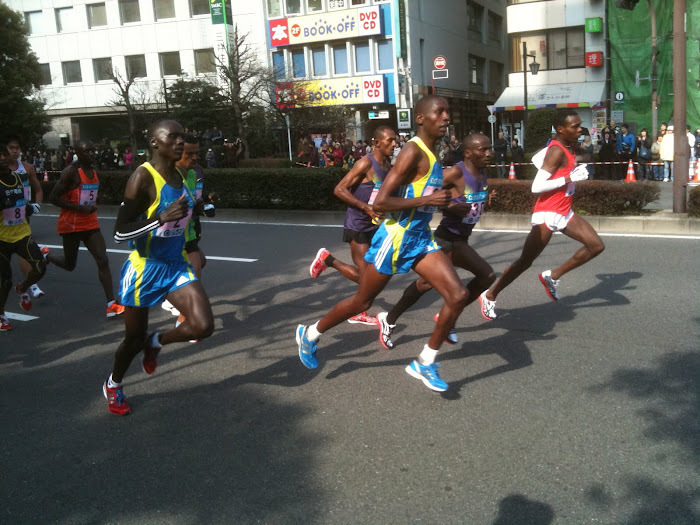 Next Sunday is the Tokyo Marathon, which is always a fun day. Cheering for club members (I think we have about 25 running) and then a great post-race party, this year at a British pub, called for some reason, Footnik. Hope you are all enjoying good weather — hot or cold, but not snow. Bet you're fast losing that tan of yours. Shame about the car ... oh ... and the race also. Stay warm. That's amazing. I'll remember to garage the car if it looks like snow. Thunderstorms this arvo, which convinced me to have a rest day. Other than that, consistent 30C or over days continue this summer.